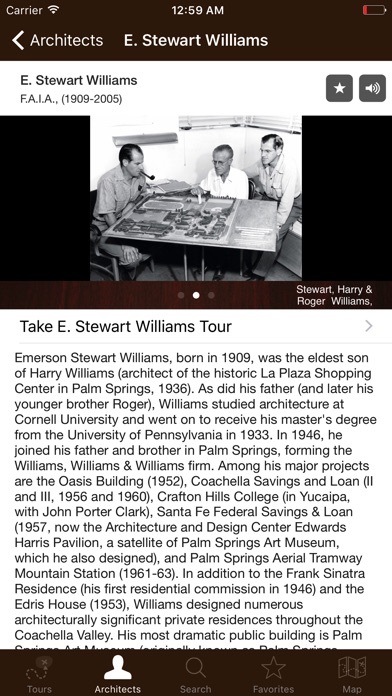 FEATURES · Guided tours of 80+ mid-century landmarks in Palm Springs, California · Tour by location, architect, or create your own custom tour · Intimate profiles of 12 leading architects · Video access to interiors and exteriors of premier properties · New & historic images, including Julius Shulman photography · Written and narrated by top architectural historians and experts PLEASE NOTE This application contains embedded high-quality video, photo, and audio content. Because of the large size, download time may vary based on your connection speed. You will need a WiFi connection to download the app to your device. We recommend you download the app through iTunes on your computer, then sync to your mobile device to reduce download time. Depending on the model of the device, the “Checking for updates” install sequence may vary. The app will also require 1 Gb of free space on your mobile device. Without enough free space the app may not install. Won’t download. Apple will not refund. 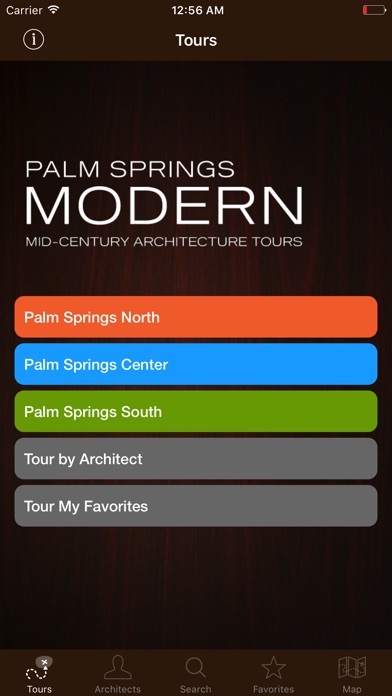 I bought this to take a self-guided tour of modernist homes in Palm Springs. The information, photos, and recorded narratives were great. Unfortunately, there are some serious shortcomings that made the app difficult to use for navigation. The driving directions, when used through the app, cause the GPS sound not to work, so it requires a person to navigate in addition to the driver. 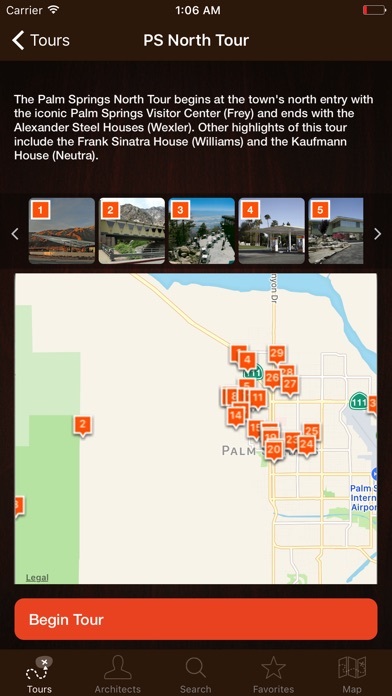 I set up a Favorites Tour, which seemed like a great idea, but although the app asked for location tracking, it didn’t use that information to put the tour in a sequence that made sense for my current location. As far as apps go, this one was expensive and I expected better performance. Not only does the app not use your GPS to “guide” you, it crashes constantly when you click on the images. You have to click the images since most of the houses have walls or gates so you cant even see them. Go to youtube and view the houses from your house to see them better. This app doesn't seem to load fully. My phone had 40Gb free but it had only partial descriptions when looking at the home descriptions. It would not pair properly with Bluetooth, so it didn't narrate through the car and caused problems with the GPS on the car. I had to switch between the audio being played on the phone and then stop it to use the GPS. I would have liked to hear the audio on the way to the house, but this didn't work as advertised. One of the house's audio description did play through the Bluetooth but I have no clue as to why that one worked and none of the others did before and after that one. Interesting app but very frustrating. Overpriced for all the technical problems that kept it from working as advertised. A new verions will ebbe released by Aug 17th 2018 for the new IOS ver 11 release - will be compatible for all IOS version, including older. 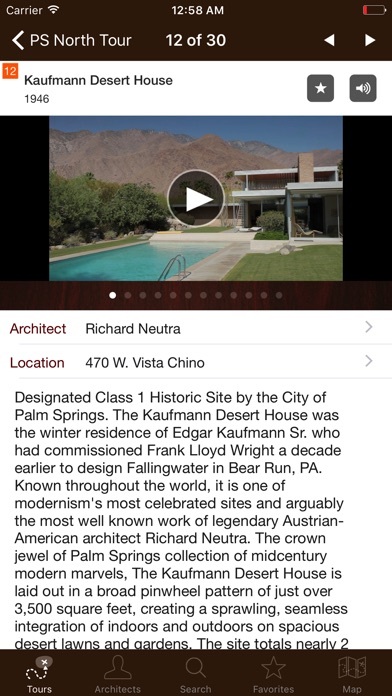 I downloaded this app several years ago and have gotten a great deal of enjoyment from it both during yearly Palm Springs stays and at home. It offers a wealth of information, great photos, maps, and videos. Apple recently sent me a message informing me that it may not be comparable on future operating systems. I hope the developers prepare the app for future upgrades. Once you get to the details, it's very interesting. 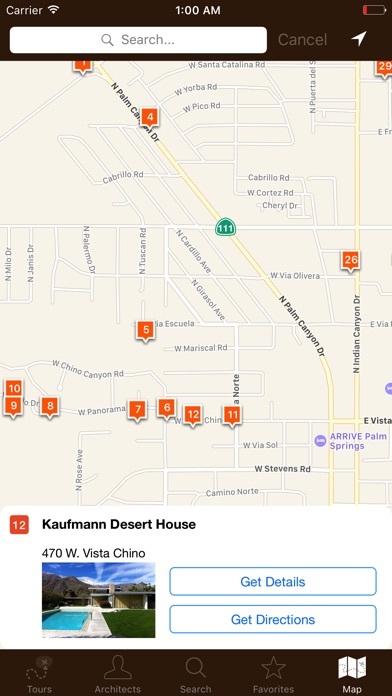 However, some numbering is off, the map isn't interactive, the map doesn't show your location relative to points of interest, and you have to go through multiple screens from map to details. This has potential. This app is literally half way done, does not work properly and should have never been released. There is absolutely no way anyone can use it effectively. Crashes non-stop, does not connect with maps app or work as designed. Also many homes featured are on private roads. Don't waste your money. Waiting for 2 hours. Hoped to take this tour but we will be out of PS by the time this loads. Want money back! More by Desert Publications, Inc.